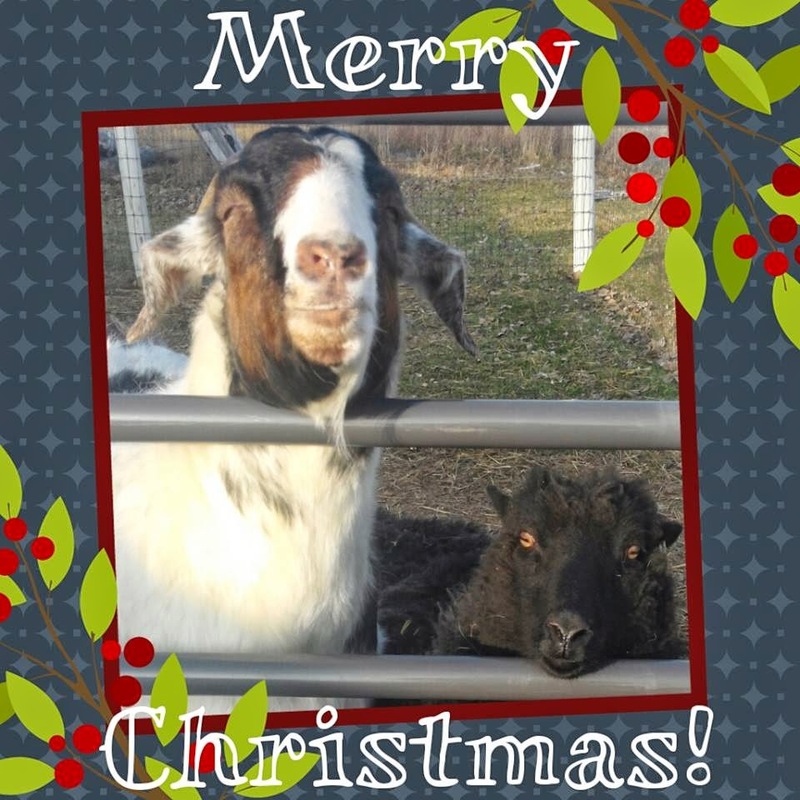 We are a 3 acre homestead located in Lenawee County, Michigan. 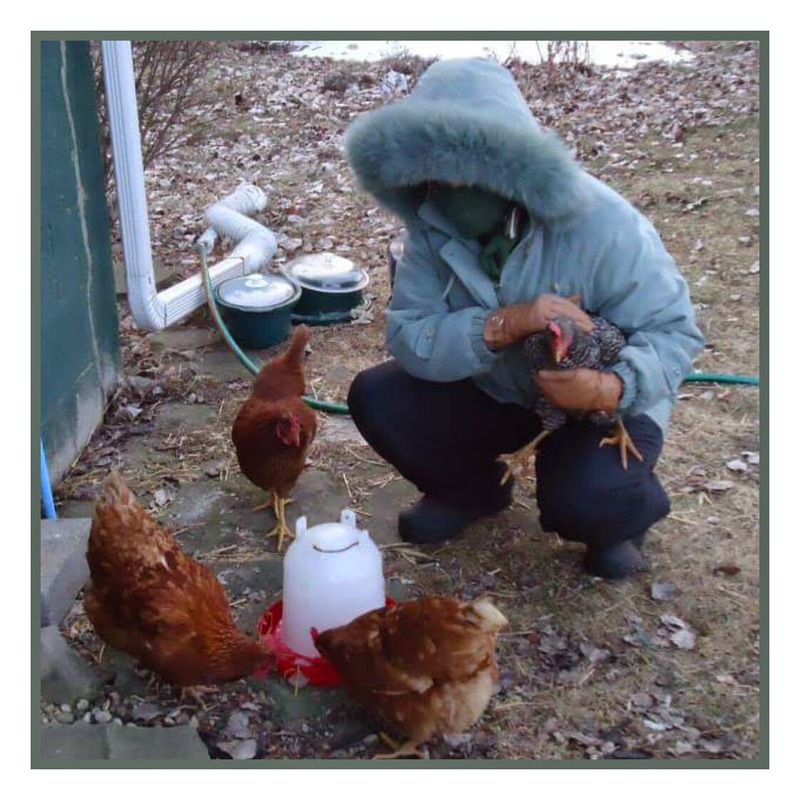 We grow all organic produce, and raise free-range laying hens. We'll be covering topics like organic small-scale agriculture, animal husbandry, food preservation, and natural DIY alternatives to everyday products. Thanks for joining us! This portable 3 ingredient dip makes a tasty dish-to-pass for holiday parties and sports watching! I have taken this dip to multiple get-togethers over the years. It's always a big hit! It can be made up beforehand and heated at your destination. Especially handy for those of us who drive an hour or more to friends' and relatives' homes! Spread softened cream cheese evenly in the bottom of a rectangular baking dish. (You can lightly heat the cream cheese in the dish in the oven for a few minutes to improve spreadability, using a rubber spatula works very well.) 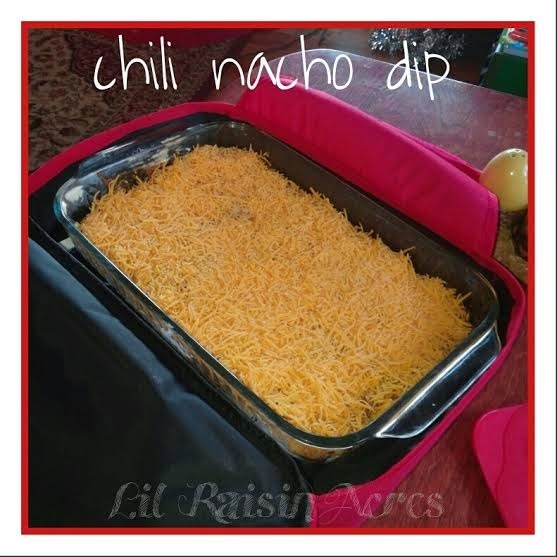 Layer chili over cream cheese, lightly spread over the cheese, sprinkle cheddar cheese evenly on top. Bake on 350 for about 15-20 minutes, or until cheddar topping is bubbly and melted. Serve with nacho chips. Everyone is reflecting on 2014, and making resolutions for 2015... Here we go! The light in the darkness of winter is seed starting, of course. Everything got off to a great start- tomatoes, peppers, basil... I have a 4 shelf "greenhouse" we place in the front picture window that faces true South, which has helped save on energy costs vs. florescent lighting. We will be using this method again in 2015! Spring came, and we planted Sugar Snap and Alaska Garden Peas from Baker Creek. They all came up and grew fabulously eventhough our growing area is still in the process of being converted from horse pasture to garden (still full of weeds of all kinds!). But, unfortunately, the long cold winter must've left the rabbits exceptionally hungry, because every last pea, save less than a dozen, were eaten! The ones we were able to save were delicious, though! We did get several new barnyard residents spring 2014- Miss Baa the sheep, Specker the Rooster, 7 laying hens (Chili and Ginger- Amber Link. Caramel, Fudge, Cookie, Cream and Brownie AKA Mrs. Edwards - Ameracauna), Drumstick and Giblets the Bronze Turkeys, and 4 Pearl Guinea Fowl. We got an unexpected surprise on Memorial Day weekend from my Sister-in-Law- a Yorkie/Jack Russell pup named Emma, which you all know as "Lil Doggie"! After the long cold winter came the dry as a bone, but very mildly warm summer. It was almost as though we didn't really get a summer. We don't have central air, so we bought a pool, only to have a summer with less than seven days over 90 degrees! Although. it was nice when harvest and canning time came! Speaking of harvest, it wasn't a very good one at all, due in part to weather, due in part to lack of proper equipment, due in part to my own laziness. While the herb garden close to the house and in range of the hose flourished, I essentially gave up on the back large vegetable garden after weeks without rain and no irrigation other than hand carrying 3 gallons of water in jugs at a time. Vast majority of the canning you saw me do this year was from my Dad's garden or purchased at the Farmer's Market in Madison. The Pink Oxheart starts I gave my Dad did extremely well, by the way, and made excellent sauce! Autumn was mild, although the rainy, cold Halloween was a bummer. We also had that one freezing cold week in early November, which worried us a little considering last winter's wrath. Thankfully, it has been unseasonably warm until today! Sadly, autumn did bring us two losses- Miss Pepper, our Barred Rock hen and one of the male guineas. I got many things I needed and a few I wanted for Christmas! New rubber boots for the barn, PJ's, slippers, a micro multi-tool, a backpack, gear for backpacking/camping... Lots more! I am anxious to try out the "Norpro 7-in-1 Slicer" I got from my Mom! I have been wanting a Mandoline slicer for canning purposes. I'll post a review! Which brings me to New Year's Eve Eve! We've been enjoying the last week in front of the comforting warmth of the new electric fireplace Brian picked up for the family for Christmas watching some movies we bought and received as gifts. As far as "resolutions"... Hmm... Well, the obvious first one is to get back into decent shape. Sure, I go outside a few times a day to check on and feed/water animals, but I need to start hoofing it more! That and old bad eating habits have been creeping back slowly (pop drinking, stopping for fast food rather than eating before we go out...). My reward will be a light hiking/camping trip on the Appalachian Trail spring 2016! Secondly, expand and be more meticulous in the garden. I mentioned the watering issue. We were given Brian's Dad's ATV, which is capable of pulling a small wagon and a self-propelled tiller. Even without a wagon, I can fit a box of perhaps 8 gallons of water at a time on the rear rack rather than carrying 3 gallons at a time by hand. We will also be able to expand and till weeds under all summer long if we can get a hold of a tiller at a reasonable price. This will also propel us closer to being able to start offering herbs and other items at the Farmer's Market! With garden expansion also comes more dehydrating and canning- I hope to try more new recipes in 2015! Lastly, I intend to write a new blog post AT LEAST once per week throughout 2015! I still have several books to review, as well as tons of recipes I can post until gardening/canning season arrives. I'll post up our seed order list as soon as it's finalized, too! I have been slacking this autumn/winter so far! Tomorrow, we head back downriver to spend New Year's Eve with my brother and his wife, her siblings, and their friends! I'm making a Chili Nacho Dip, which I will post the recipe for tomorrow before I leave! Hope everyone has a safe and Happy 2015!!! 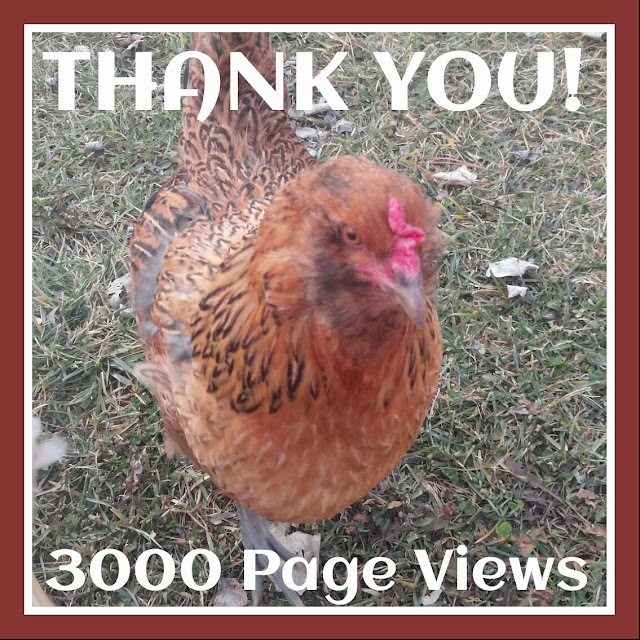 3000 Page Views, Thank YOU! What a wonderful belated Christmas gift! We surpassed 3000 page views this past week!!! THANK YOU!!! Hope everyone had a wonderful Christmas! Have a safe and Happy 2015! As promised, here are the 2 recipes I used for our Christmas Candy this year! Extremely simple, these recipes are made using only a microwave! 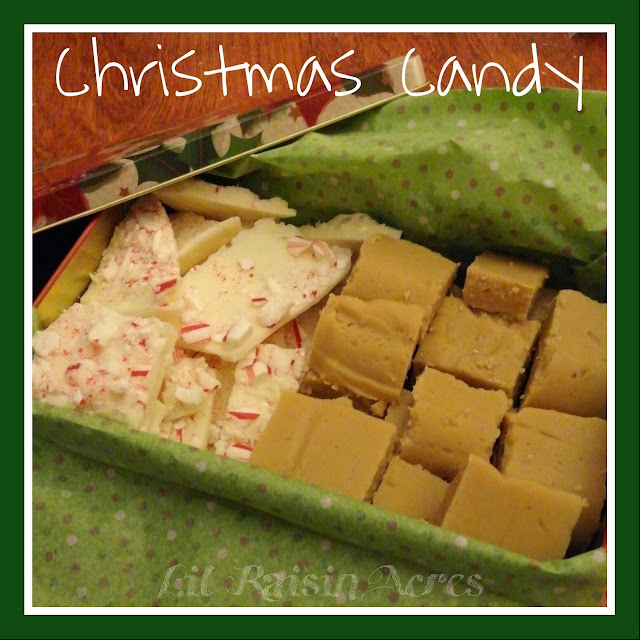 We kicked off the Christmas cooking last night with Peppermint Bark and Peanut Butter Fudge. These were both new recipes for us, and we're very pleased with the results. To be honest, I was a little skeptical in using the microwave for the fudge, but it is delicious! The toughest part of the entire candy making evening was breaking up the Peppermint Bark after it had cooled! You will also want to pat the candy cane chunks down into the chocolate a bit to assure they adhere, a lot tends to fall off while breaking it up. We did not use the red food coloring in ours. We're taking tins like the one above to our family get-togethers, as well as giving one as a neighbor gift. We got the tins and tissue paper at Dollar Tree. One batch of each recipe fills 2 5x7" tins. ONE Week Til Christmas Eve! Time sure flies! 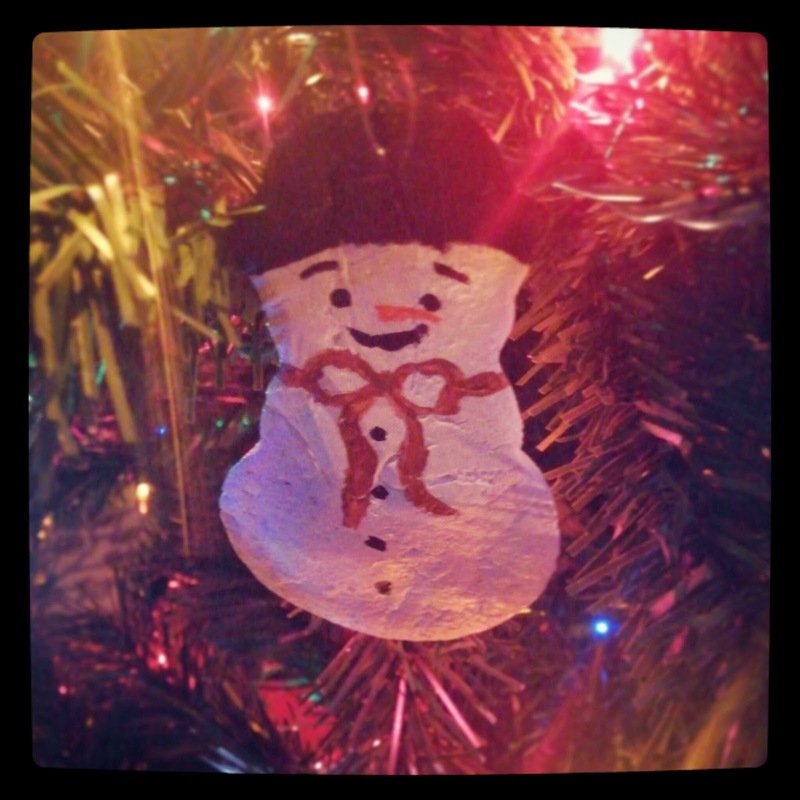 Just one week until Christmas Eve! It's going to be an extremely busy week here at the farm. Our festivities actually begin Saturday, with a dinner and gift opening at my parent's place, with our big family Christmas dinner at Grandma's on Christmas Eve. It'll be Grandma's 91st Christmas this year! With family dinners come potluck dishes. This week, we'll be baking Sugar Cookies and making Peanut Butter Fudge. We'll also be giving Peppermint Bark a go this year. Of course, it wouldn't be a holiday without Deviled Eggs, I'll be whipping up a few dozen or so of those as well. Another quick and easy potluck offering idea- home canned pickles. We plan on taking a couple jars along with some venison jerky, too! Seems like a lot of food, but when you have 5 sets of aunts/uncles, 16 cousins plus spouses and their children, your parents, a brother and his wife, and a neice... That's a lot of hungry people! LOL I always take my seat at the table bearing the appetizers. My uncle brings a shrimp platter with homemade spicy cocktail sauce, and there's always a vegetable tray, along with my eggs. That's a meal in and of itself for me! Along with all the baking/cooking generally comes present wrapping, but with Britt's help, I can happily say it's all already out of the way! I absolutely love online holiday shopping. It is such a time saver, and when you live in a rural area, it can certainly be money saving as well considering fuel. We did take a trip to Cabela's though, and I'm glad we did. They had a lot of cute novelty gifts we picked up, and I found myself an inexpensive multi-tool to keep in my barn coat pocket! I can't tell you how many times I've gotten out there and no knife to cut the feed bags open with, or a screwdriver to tighten a loose screw on the coop latch! Right about now, I bet those cute little decorative gourds and squash you purchased around Halloween are starting to become moldy. It's the perfect time to save their seeds! Saving seed from decorative squash, gourds and miniature pumpkins is simple, and since they're simply for looks, cross pollination isn't as much of a worry. In fact, can lead to something new and interesting! It's actually easier to save seed from fruits that are starting to dry out on their own. Fair warning, however- once you cut into them, there could be a foul stench and off colored, gross textured pulp! Simply cut the fruit in half and scoop seeds into colander, with as little pulp as possible. Rinse seeds thoroughly. You may have to manually remove large chunks of pulp that will not fit through the colander. 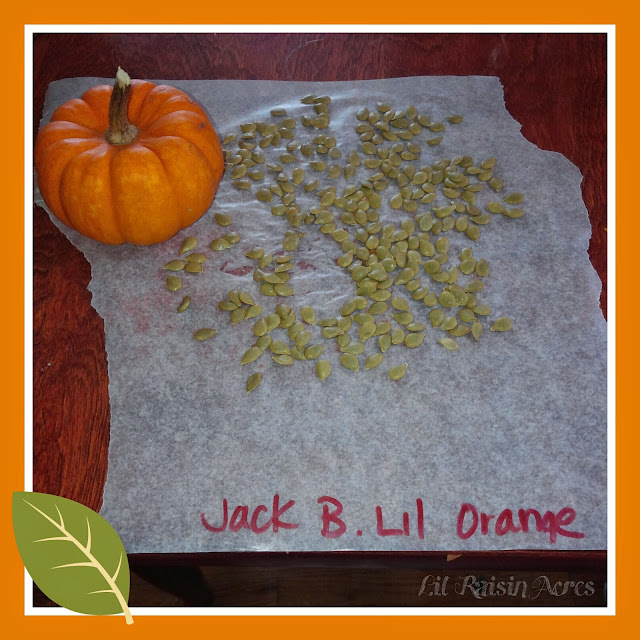 Spread drained seeds out on a sheet of wax paper in a well ventilated area and allow to dry for several days. When seeds are completely dry, place them in an envelope and label with the name of the variety of fruit (or a description of it, if you don't know what variety it is). Carrie Ann Seal-Stahl. Ethereal theme. Powered by Blogger.